Puppies do it. Kittens do it. Elephants and monkeys do it. And yes, young boys and girls do it. Rough and tumble or big body play (BBP) like running, climbing, jumping and even wrestling is necessary for proper brain development in children and beneficial for building relationships and developing healthier bodies. physically challenging ways. Our shaded outdoor play areas are designed with safety in mind with equipment appropriate for each age group. 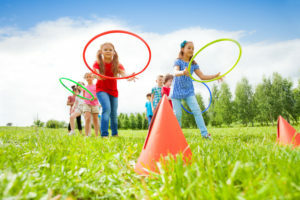 During the rainy days of spring and the hottest days of our Texas summers, children participate in large muscle play within classrooms, atriums, and fitness rooms at each of our 19 greater Austin area locations. Dynamic Systems Theory is a theory of motor development which links the development of movement to the development of cognition (Thelen and Smith, 2003). Meaning children’s brain development is connected to specific motor developmental milestones. 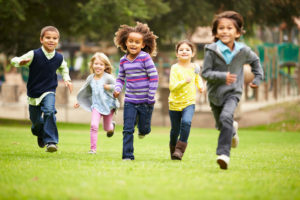 Research demonstrates after 15 minutes of intense physical activity, children are calmer for a longer period and have an increased attention span (Carlson, 2016). Children who participate in BBP demonstrate increases in their confidence and independence. Rough play leads to the release of chemicals that affect the brain areas responsible for decision-making and for social discrimination (Carlson, 2016). According to psychologist, James Borg, human communication is 93 % body language and 7% of words themselves. Through BBP, children learn and respond to one another’s body language, they detect when someone needs a break or is hurt. Children learn to read these important nonverbal social cues through these close interactions. Shared experiences bring children together by allowing them to alternate roles (chase and flee) and take turns with games like Duck, Duck, Goose. Children who participate in big body play are more physically fit. 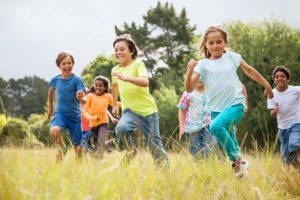 They are often stronger, faster, and have longer endurance than peers who do not participate in such play.Intense physical exertion enables children to learn their body’s limits. BBP allows access to appropriate physical contact. BBP, children will laugh, run, jump, tag, chase, and flee. Children’s expressions are often smiling. Children are involved as willing participants. Children will keep returning for more play. However, when children are fighting, they hit, push, grab, frown, or cry. Their expressions are sad or scared and as soon as it settles, the unwilling participant runs away (Carlson, 2016). Recognizing these differences teachers and parents alike can supervise closely to intervene if needed. The second myth connected with BBP is only boys need it, not girls. Though big body play among girls make look different, research suggests girls who participate in big body play are more likely to be assertive, confident, and outgoing. Play Is Essential to Children’s Development and Learning, describes several ideas for creating safe environments in which children can participate in this rough and tumble play in a safe and socially acceptable manner. Indoors – move large furniture pieces away and add mats for children to climb over and roll across. Outdoors – provide climbing structures with proper ground coverage like turf or pellets. Discuss signals and teach how to read the body language of another child to indicate that the play needs to pause. Talk about what is allowed in this space – is it just for running or climbing? Provide clear limits so children know their boundaries regarding BBP. On climbing structures, children may choose to test their own limits, be there to provide proper support so they may do so in the safest way possible. Supervise closely and watch for cues or signals for when children may need to take a break. Though we do not endorse wrestling on our school campuses, we do promote healthy and boisterous play in which children are able to test their personal limits and physical development in a safe and fun way. Borg, J. (2011). Body Language: How to know what’s really being said. 2nd Edition. Pearson Education Limited: Harlow, England.